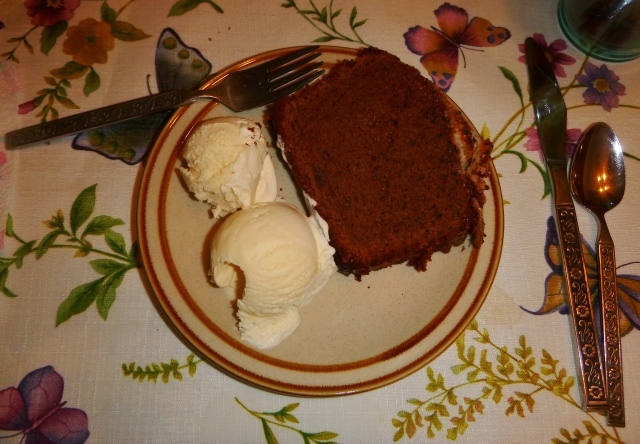 Chocolate-Coconut Pound Cake with vanilla ice cream. My father purchased a coconut at the grocery store. When my father was a child in the 1950s as a treat my grandmother would buy a coconut, drain the coconut liquid out for the family to drink, and make things from the raw, unsweetened coconut. I have in my memory the story she would take the coconut out to my grandfather’s wood shop, put the coconut in a vice, and use a hand drill to make a hole. Dad used a screwdriver and clawed hammer to pound an opening. 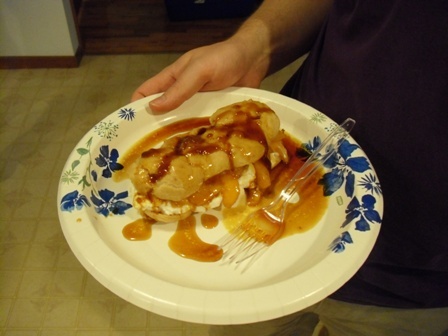 He poured off the coconut liquid which mom used in her smoothies, and pried the rich, white meat from the shell. What was he to do with all that coconut meat? 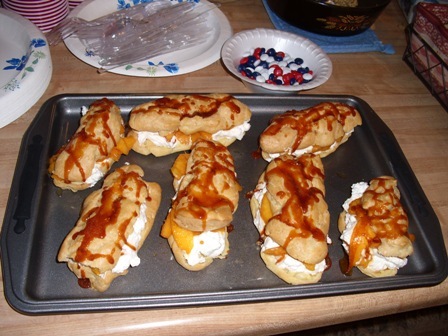 He has images of heavenly coconut cream pies with fluffy, sky-high meringue like his mother used to make. I will get the pies made, eventually, but I wanted to try a cake first. This is a cake recipe I had put back and waited to make. I had no idea how much of the raw coconut would be required for the 1/4th cup (by volume) as called for in the recipe. This is partially why I did not tackle the coconut cream pie because I had no idea how much coconut would be required. I hand-grated frozen coconut pieces. I did not make a dent in the sum total of all the coconut by removing a grated 1/4th cup. We have enough coconut for several pies. I need to find a better way to grate the coconut meat. Following the directions, I buttered the loaf pan and lined it with parchment paper. You need to leave the “generous overhang”. 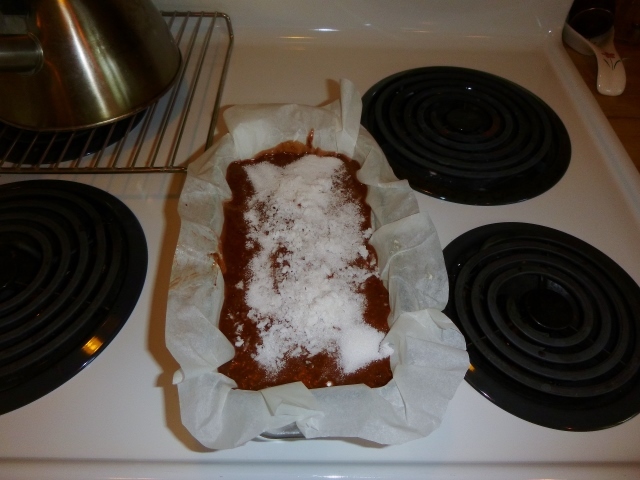 The browned paper edging looks classy, I think, and that overhang keeps the batter when poured into the loaf pan inside the parchment paper and away from the pan walls. I would recommend cutting the parchment paper into a circle before placing it into the loaf pan. 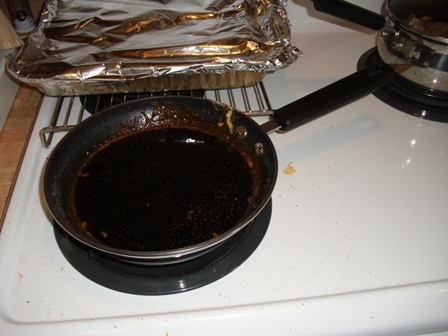 The square ends of the parchment paper burn and smolder, while a circle shape browns without catching fire. I did not think of this until the paper had been placed inside the loaf pan and cut the edges of the overhand into an overall circle shape. The cake batter went together well. Make sure to use a stand mixer with an very open bowl because you need to aerate (add air) to the batter. Beat at medium-high speed for the entire time period, 5 to 7 minutes before eggs, and 5 to 8 minutes after eggs until the batter volume has doubled. You want a light batter. With a slow speed, add the dry ingredients and the buttermilk as directed. As soon as the dry ingredients are moistened and just incorporated, stop the mixer. Cease, halt, and discontinue the electric mixer. You may want to take a couple of turns with a spatula to clean off the sides of the mixing bowl, but that is it. Gently pour the batter into the cake pan, and run spatula down the center of the full loaf pan. Sprinkle with the tablespoon sugar and all the coconut. Pound cake batter topped with white sugar and grated coconut before it has been placed in the oven. When I sat down to read the recipe before preparing the batter, my first thought was there was no way this cake would be done in a 325 °F (163 °C) oven in 70 minutes. Experience told me this cake, with or without foil to protect the coconut from scorching, would take 90 minutes to bake. I was correct. I gently placed the cake in the oven and set the timer for 60 minutes. I did not open the oven once in those 60 minutes. When the timer beeped, I opened the oven and surmised the cake had a long ways to go to be done. There was still liquid on top of the cake. I set the timer for another fifteen minutes (75 minutes total baking time) and waited. When the timer beeped, I tried, again, and the toothpick tester was wet with cake batter. I set the timer for another fifteen minutes (90 minutes total baking time). After 90 minutes, the cake was done, but could have been removed five minutes sooner. The bottom corners of the cake were slightly overdone, but the cake was cooked through. Next time I will allow 85 minutes total baking time. Chocolate-Coconut Pound Cake fresh from the oven. I planned to serve the cake for dessert for our family Sunday afternoon dinner. The additional baking time pushed allowing the cake to cool in pan to fifteen minutes before I sliced it. This did not hurt the cake. 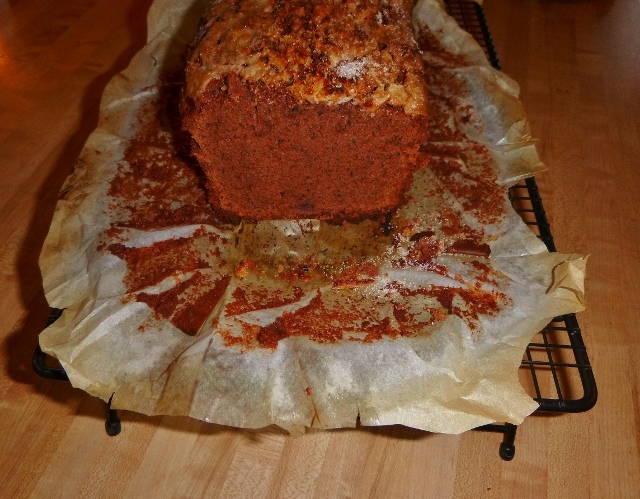 Chocolate-Coconut Pound Cake after it has been sliced. Next time I go to a community meal or supper get-together, I will seriously consider preparing this cake. 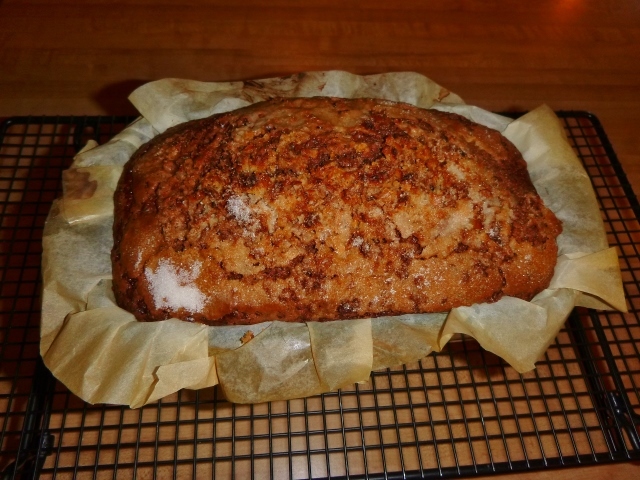 It looks so charming presented in the parchment-lined loaf pan. 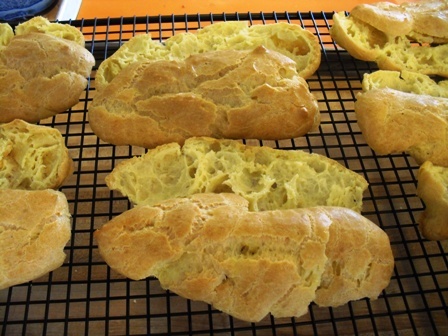 It is an easy recipe to make, it just takes time to mix in the electric mixer and bakes for an hour and a half. Richard Simmons is correct. You do not know what is going to happen next. Make your cake and eat it, with ice cream, and chocolate syrup, and excellent coffee. Savor what you have when it is in front of you. Enjoy. Here, too, is Epicurious’ instructions on how to open a coconut.